Starts up again on January 8th and continues through the year. Nordic Pole Walking is a low-impact exercise that can be done by nearly anyone. It works 90% of your muscles and burns up to 46% more calories that regular walking. Nordic Pole Walking is a low-impact, easy to learn, and enjoyable exercise for people of all ages and fitness levels. There are approximately 350 scientific and clinical studies pointing to the health benefits of Nordic Pole Walking. Nordic Walking Poles differ from hiking, trekking, or ski poles. They are adjustable, ultra light, and fit each individual so as to engage more than 90% of all body muscles. Millions of Europeans use Nordic Walking Poles, walking for health, fitness, and social enjoyment. 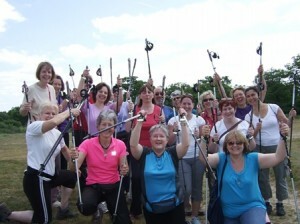 Statistics show that Nordic Pole Walking is the fastest growing outdoor activity on the planet.